Sometimes, unadorned is a good thing. In its austerity, this Borge Breastplate and Pauldron Set achieves a distinctive look, one that brings defense and a unique sort of style to any ranger, soldier, or fighters overall appearance. Actually, austere is a very good word to describe this armour. The general design incorporates several layered pieces of leather, which seem to be held together by leather lacing and grommets, all arranged at the edge of the plate and set in a decorative crisscross design. Four lines of this cross-hatch stitching adorn the breastplate, lending it a hand-crafted look that matches perfectly to its general strength and appeal. 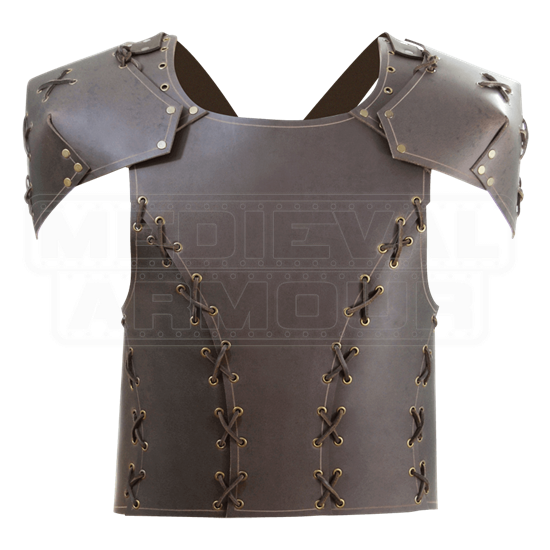 In spite of its look, the breastplate is also fairly hardy in design, thanks to it being made entirely from rigid 9-10 oz. buffalo leather. The breastplates shoulder straps are reinforced with extra leather plating, while also featuring grommets along its length, which allows for the armor to be slightly customized, either by adding different styles of tied pauldrons or by securing personal accents to the armor along the shoulders. As its name implies, this Borge Breastplate and Pauldron set comes complete with two options already included, those being matching pauldrons that are layered from the same leather and adorned with the same crisscross lace design. They are every inch as effective as their parent armor, and when secured onto the shoulders, they add to the defense and the visual appeal of the armor, making them a must-have addition when it comes to giving yourself sufficient protection. It is available in four sizes, with each featuring a quartet of leather straps with buckle closures for wearing. One strap each goes over each shoulder and crisscrosses over the back, while the last two secure around the back. Because it fits more around the waist than the chest, the armor is sized according to the waist, as opposed to the chest. Simple is not always a bad thing. 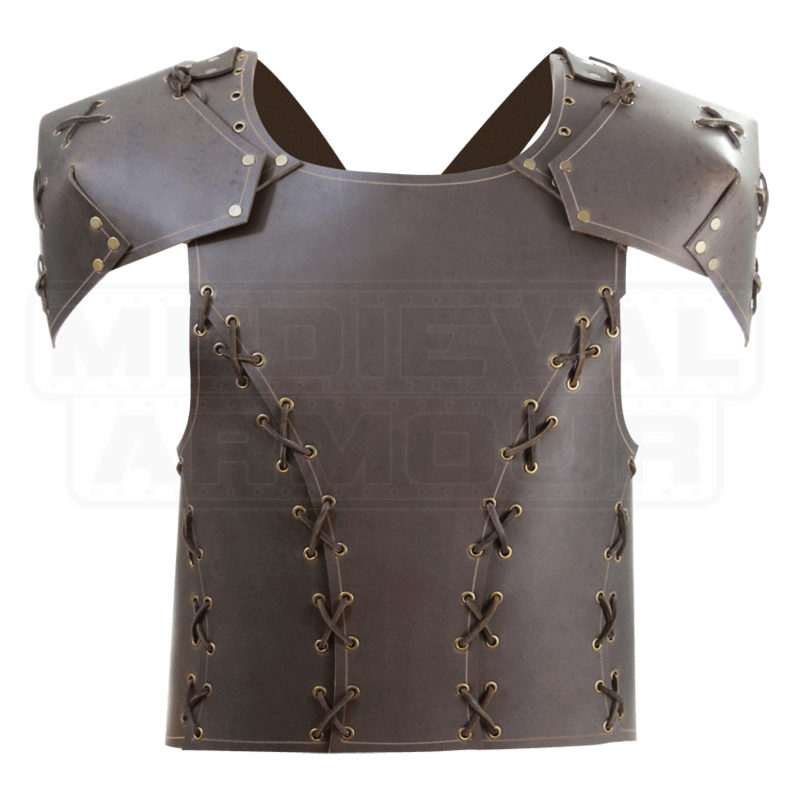 The clean lines and refreshingly unadorned style of this Borge Breastplate and Pauldron Set makes it a killer addition to any warriors look, as well as a fine piece of protection to arm yourself with before you head off into your next LARP battle.